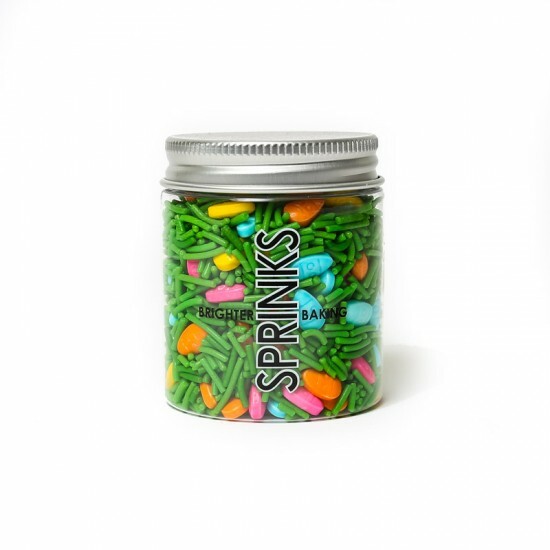 Pastel egg shaped sprinkles hiding in green sprinkle grass! Easter Bunny cookie cutter, 3.5" across the largest points.Sturdy tin plated steelTin cookie cutters are not dishwasher safe. After using yo..
Easter Egg Cookie Cutter cookie cutter, 4" across the largest points.Sturdy tin plated steelTin cookie cutters are not dishwasher safe. Afte..
Wilton Large Multi-Opening Tip #234 - Grass, Hair or Fur Easily create a textured fur or grass look. Fits large coupler or use in a dis.. Number 5 Glitter Cake TopperThick card stock - glitter on the front onlyApprox 3" tall excluding bamboo spikeAn affordable alternative to acrylic topp..
Americolor Soft Pink Gel ColourAmericolor Food Colorings are Soft Gel Paste colorings. Soft Gel Paste™ represents a completely new approach to food ..
18" Disposable Piping BagsUse with any piping tip. Easy clean up, strong plastic means they won't burst very easily! This makes them ..
Chefmaster Liqua-Gel Colouring.Highly concentrated gel colours in a wide range of shades. Safe to freeze and fade resistant. Suitable for use in ..
Wilton Train Cake PanWilton cake tins are a great way to make fantastic looking cakes, even if you don't have cake decorating experience. Simply..
Set of 2 Mickey and Minnie Mouse plunger cutters. Embosses detail onto fondant, gumpaste, cookies, etc as they cut out. Approx 5cm each at ..
A favourite of many cake decorators, Pettinice is easy to use, and tastes great. 750g pack.Gluten Free, Dairy Free, Vegetarian, Halal, KosherThe.. Some of the world's renowned cake designers and sugar artists call Satin Ice their brand of choice for rolled fondant and gum paste. Satin products ca..
Spiderman Cupcake Icing Images15 per sheet in 3 different designsSwirl icing on your cupcake and place the edible image circles on top..